Christopher Souers (1695-1758) was an early 18th-century clock-maker from Germantown. A rare example of his work is on display at the Library Company of Philadelphia. The horologist tasked with bringing this clock back to life, was confronted with many difficult choices as well as an experience to learn deeper and more nuanced horological methods. 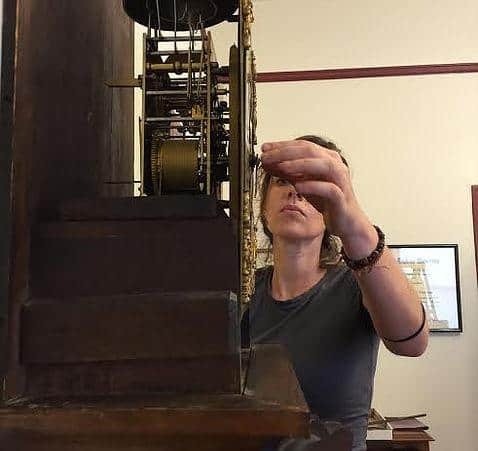 The process of preserving the integrity of the clock’s past, as well as the integrity of its future, sometimes felt at odds with one another. This lecture will discuss the delicate balance between honoring the two intentions. 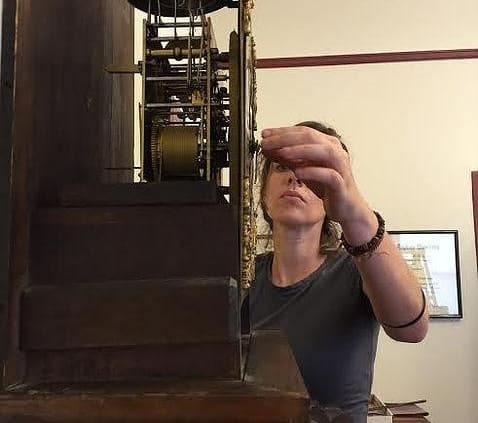 Our speaker, Lili von Baeyer, the clock contractor for the Pennsylvania State Capitol Complex, oversees the maintenance of 280 historic government clocks, as well as for the United States Senate clocks on Capitol Hill. Lili has carried out work for many companies and institutions including: Chelsea Clock Co., Detroit Historical Museum, M.S. Hershey Foundation, The Franklin Institute, The National Association of Watch and Clock Collectors, and various private conservation companies. She is currently teamed with Johnson & Griffiths Studio, who together won a 2014 Preservation Achievement Award from the Preservation Alliance of Philadelphia.